The total solar eclipse of 2016 took over the skies in Indonesia and the Pacific Ocean region on Tuesday evening and people who were lucky enough to witness it knelt in prayer while others gazed at the sky in awe. The moon briefly passed directly in front of the sun at 8:38 to 8:42 pm ET, as tweeted by NASA. The rare astronomical phenomenon could be appreciated across 12 Indonesian provinces, enclosing three time zones and an estimated of 40 million people. In other areas of the Indonesian archipelago, a swath of Asia and in northern Australia people got to see a partial eclipse. Observers could watch as the moon was passing in front of the sun in a 90-mile-wide strip of sea and land that included Sumatra, Borneo, Sulawesi and other islands, as well as an empty patch of the Pacific northeast of Hawaii. “I can now see [solar] prominences — they are beautiful. Wow!” Paul Cox said Tuesday evening from Sulawesi, where he was hosting a live eclipse webcast for the Slooh Community Observatory. His excitement got to a higher level as he witnessed the “diamond ring effect,” in which the sun-moon pair looks like a piece of gigantic sky bling. “That is the most beautiful thing I’ve ever seen”, Cox expressed, as reported by NBC News. On Sept. 1, an annular type of solar eclipse will be visible from some areas of Africa and North American skywatchers will be able to witness the so-called “Great American Eclipse” on Aug. 21, 2017, from a swath of the north-central United States that will stretch from Oregon to South Carolina. The phenomenon will be a total eclipse, and a partial version will be visible in most of North America. The Great American Eclipse will come shortly after a mid-summer bright day has started. The skies will gradually darken as if some big storm was coming. A few stars are likely to come out and animals will get confused and quickly go home to sleep. Observers will witness a strange yellow-orange glow all around the horizon resembling an early sunset. Then, the sky will brighten up again just as suddenly. Birds and animals will get out and the stars will disappear to let the sun return. 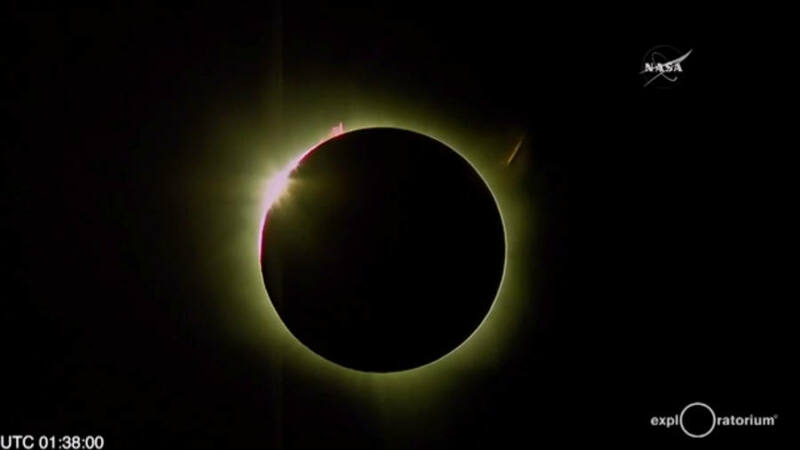 According to a report by Space.com, astronomers predict 68 total solar eclipses during this century, meaning that there will be one every 17.6 months.